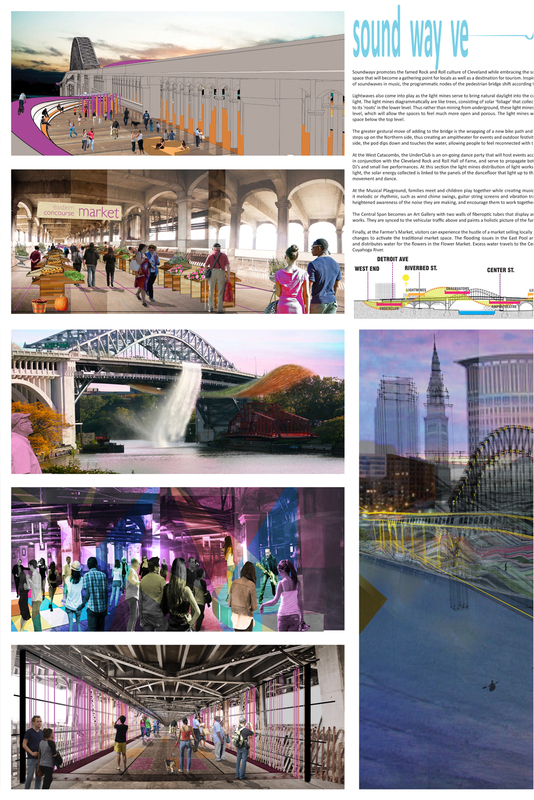 Overview: Soundwayv promotes the famed Rock and Roll culture of Cleveland while embracing the family oriented nature of the city into a linear social space that will become a gathering point for locals as well as a destination for tourism. 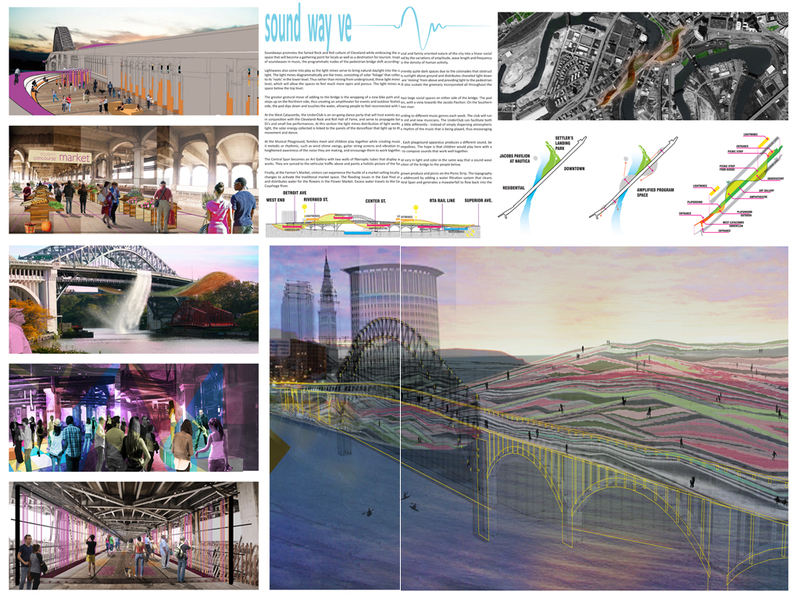 Inspired by the variations of amplitude, wave length and frequency of soundwaves in music, the programmatic nodes of the pedestrian bridge shift according to the density of human activity. 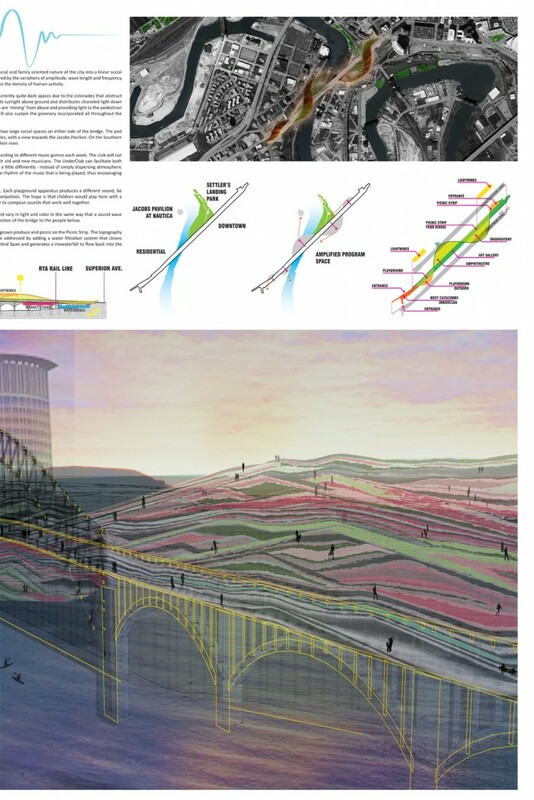 The greater gestural move is the wrapping of a new bike path and two social spaces on either side of the bridge. The pod steps up on the Northern side, becoming an ampitheater for outdoor festivities. On the Southern side, the pod dips down and touches the water, allowing people to feel reconnected with their river. The West Catacomb UnderClub hosts events according to different music genres each week. At the Musical Playground, each apparatus produces a different sound, such as wind chime swings and vibration trampolines. The Central Span becomes an Art Gallery with fiberoptic walls that vary in light and color according to traffic density above. Finally, at the Farmer’s Market, the flooding issues are addressed by a water filtration system that distributes water for flowers in the Market. Excess water travels to the Central Span, generating a waterfall to flow back into the Cuyahoga River.